OK now, everybody hum a few bars of the Barry Sadler song, Ballad of The Green Berets. It’s the mid-1960s. The Vietnam war is still a ‘good’ war in the minds of most Americans. In 1961 President Kennedy had turned the spotlight on the US Army Special Forces, the Green Berets. When Kennedy found them they were an obscure group of soldiers operating out of Fort Bragg, North Carolina, led by officers who had worked closely with partisan groups during WWII and understood the value of conducting behind-the-lines operations to disrupt, demoralize and undermine an invading enemy’s operations. The Big Army brass didn’t much like them – they were independent, unorthodox, and perhaps worst of all they insisted on wearing those damned green berets. But they were having an impact, particularly in Southeast Asia where they were leading South Vietnamese and other native forces in surprisingly effective operations against the Viet Cong and other communist-inspired forces. The Big Army brass may not have liked these cocky Green Berets but there was no arguing they were having great success with their unorthodox methods and tactics. Then in 1965 author Robin Moore published his best seller ‘The Green Berets‘, a semi-documentary novel of Special Forces operations in Vietnam. Moore had spent almost two years training and then deploying to Vietnam with a Special Forces unit so he was writing from the inside, with a special perspective on the unit, its men and its mission. (Significantly, Robin Moore is the first and, as far as I know, only civilian to attend and graduate from the US Army Airborne School at Fort Benning and earn his jump wings.) Moore’s book was an instant best seller. It pushed the Green Berets back into the spotlight and, this time, into popular culture. Suddenly America couldn’t get enough of the Green Berets. There were Green Beret magazine covers, comic books, toys, documentaries, songs and a John Wayne movie. And even trading cards. Yes, bubble gum trading cards! In 1966 the Philadelphia Chewing Gum Corporation (P.C.G.C.) got the rights to use some US Army promotional photos on a series of trading cards about the Green Berets. There were 66 cards in the series (one card to a pack of gum to ensure brand loyalty and continued sales). The cards were typical Army stock photo stuff – Green Berets jumping out of airplanes, rappelling out of helicopters, training with machine guns, etc. All highly sanitized for mid-60’s pre-teen consumption. No blood, no gore, no torture (you know, the typical stuff a pre-teen sees today on prime-time television). I’m not sure how long the series ran, but I do remember seeing these cards for sale and buying a few myself while my family lived in New Jersey back in the 1960s. Since this card is the only one of the set that deals with the use of maps I thought I’d toss it up here. It looks like the picture was taken during an exercise. 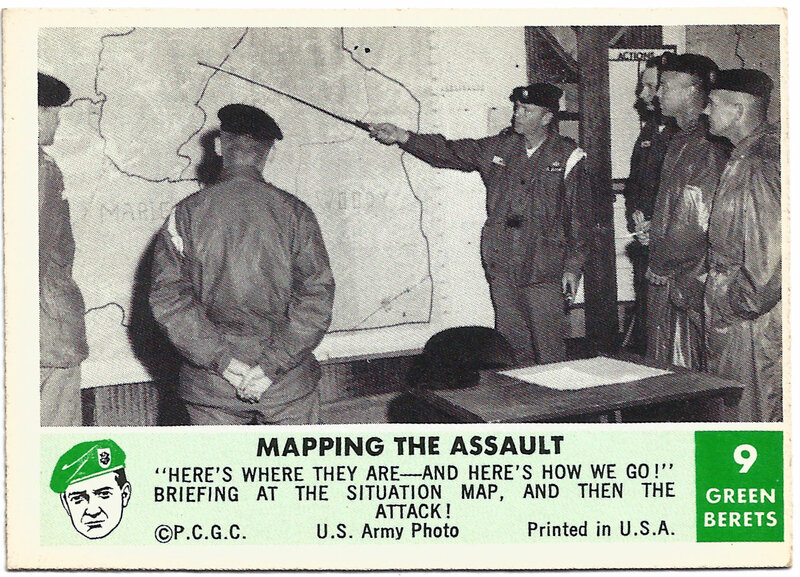 The white tape pinned around the sleeves of some of the Special Forces soldiers indicates they are evaluators (‘white force’) for an exercise, and may be providing an overall exercise briefing to the two Green Beret soldiers standing on the right and staring intently at the map board. It must be raining outside, because these two visitors are wearing their wet weather jackets and they look damp. The picture quality isn’t good enough to indicate what area the maps on the map board cover, but it’s a good bet that it’s somewhere around the Fort Bragg area. You can make out some geographic boundaries highlighted on the map board, and one has been named ‘Maple’ (or ‘Marie’) and the other ‘Woody’. Probably notional countries or regions created for use during the exercise. Based on the general patterns I see on the map board these are probably a series of Army Map Service 1:50,000 scale map sheets taped together to make one large, continuous coverage map. There’s little else we can glean from the photo other than it’s cold (and wet) outside – many of the participants are wearing what look to be M-1951 field jackets. The overall setup has a familiar exercise control cell look about it, somewhat spartan with the field table and chair set before the map, a copy of the exercise order sitting on the table and some status boards and another map board hanging on the wall to the right. Been there, done that many, many times over. I’m told by active duty soldiers that things haven’t really changed. Even in this era of unlimited bandwidth, live data feeds. advanced digital mapping and command and control software and high resolution large format displays there are still old-fashioned map boards that go up for every exercise ‘just in case’. I guess the more things change the more they remain the same. Makes an old topographer smile. This entry was posted in History and tagged army, maps by Brian Haren. Bookmark the permalink.